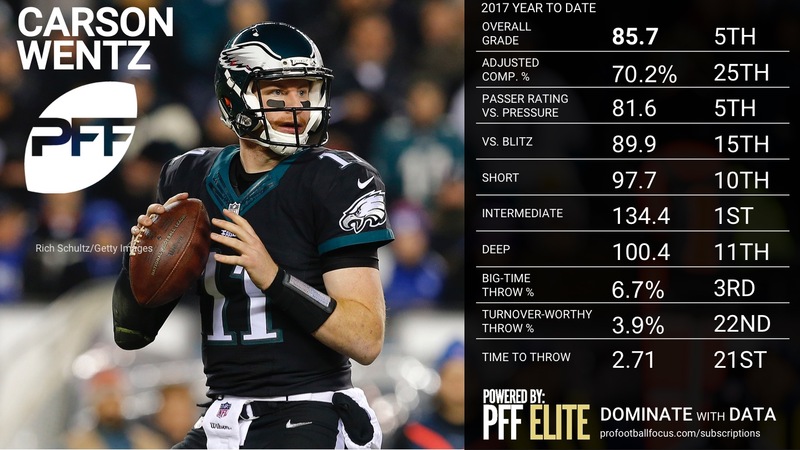 PFF Analysts Steve Palazzolo and Zac Robinson give you an overview of every team’s quarterback, and where they rank in terms of overall PFF grade as well as detailed notes on a select few who stood out for good, or bad, reasons in Week 12. 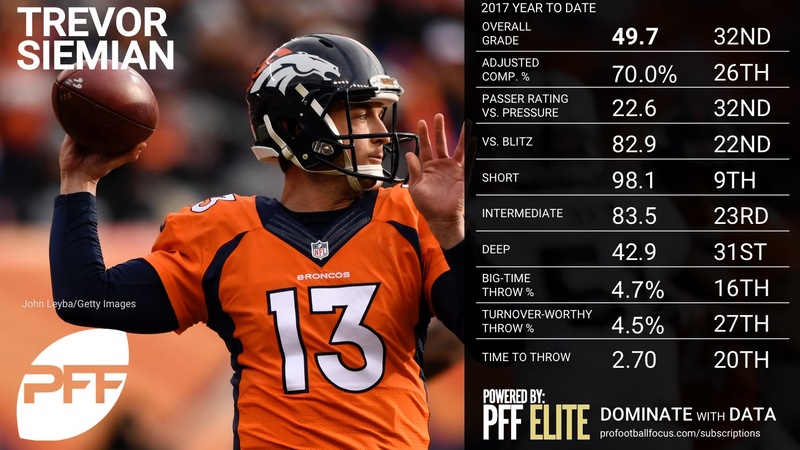 These rankings are based on their overall grades after Week 12, and can be found as a part of the PFF Edge subscription. 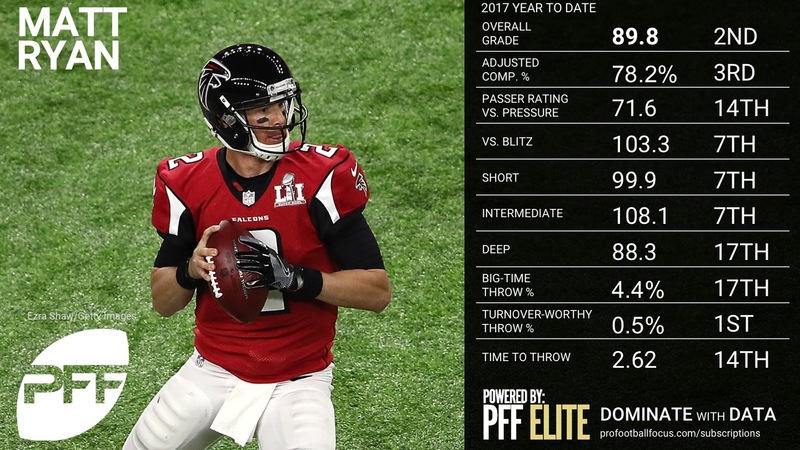 Ryan’s level of play the last four weeks has been the best in the NFL, as he and the Falcons offense have found the type of rhythm they played with all of last season. Ryan was deadly at the intermediate level of the field on deep crossers and out breaking routes to Julio Jones, going 6-of-6 for 139 yards on throws traveling between 10-19 yards in the air. 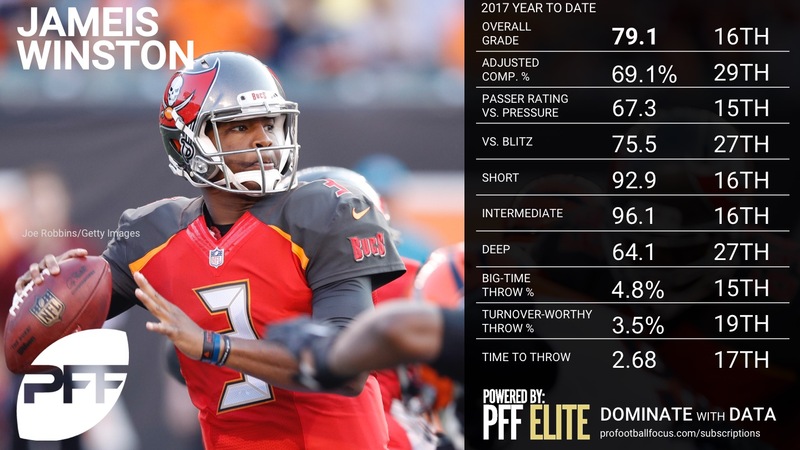 The Buccaneers variety of zone coverage were no match for Ryan, as he completed over 90 percent of his passes vs all zone coverage looks. 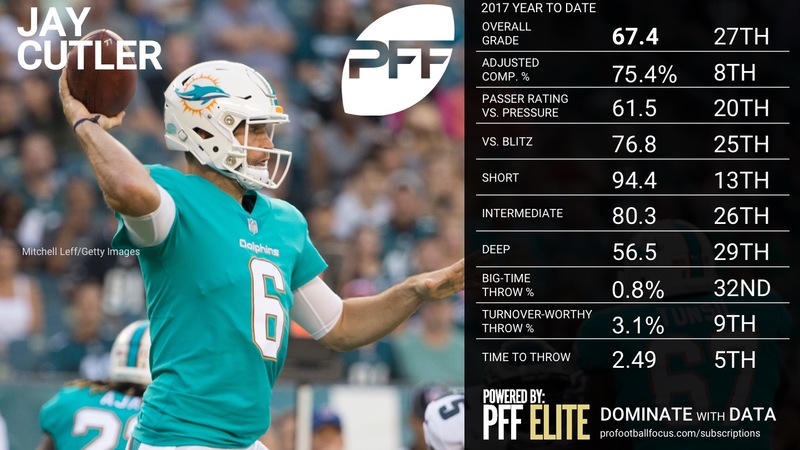 Ryan has come into last year’s form on his deep shots over 20 yards down the field, as over the last five weeks he has completed 56.5 percent of his throws (fifth-best during that span). 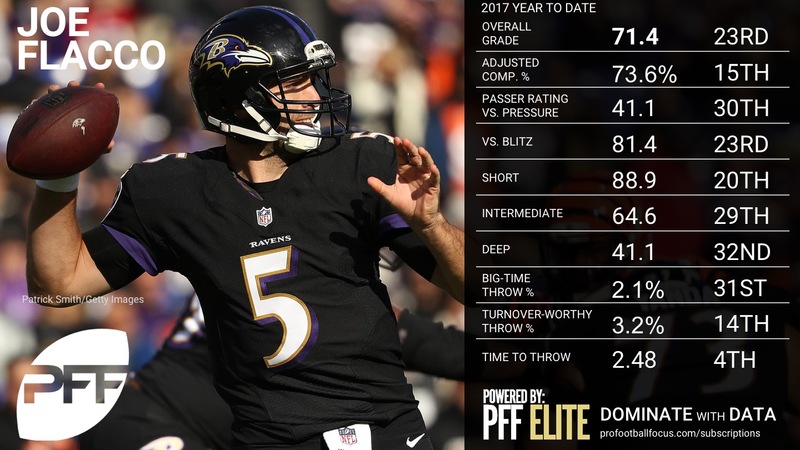 Ryan’s bad interception luck at the beginning of the season has leveled off, as he has the fewest number of turnover worthy throws on the season. Roethlisberger and the Steelers offense continues to roll, as they spread the Packers defense out and picked them apart with throws all over the field. 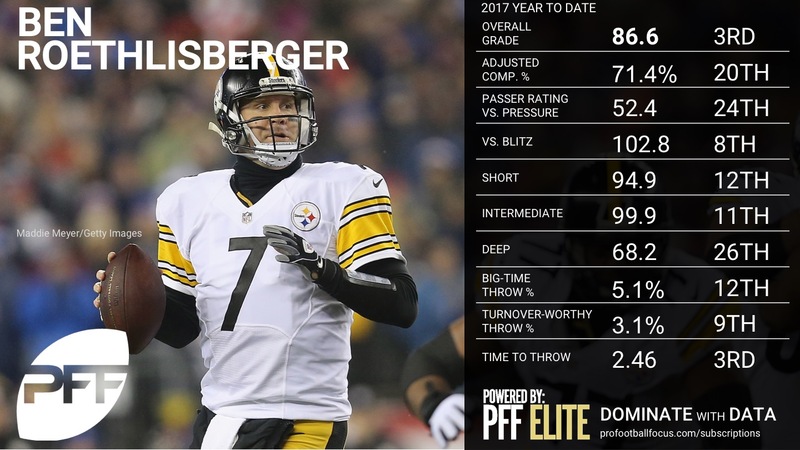 It was Roethlisberger’s highest grade of the season, as he made a number of big time throws down the field, and was accurate operating underneath. The Packers tried to move the secondary around at the snap often and play coverage, blitzing on only four of his 49 dropbacks, but Roethlisberger consistently found the open man no matter the defensive look. On the final drive, he was able to find Brown in the cover-2 hole between the corner and safety with Brown’s incredible sideline catch that set them up for a game-winning field goal. 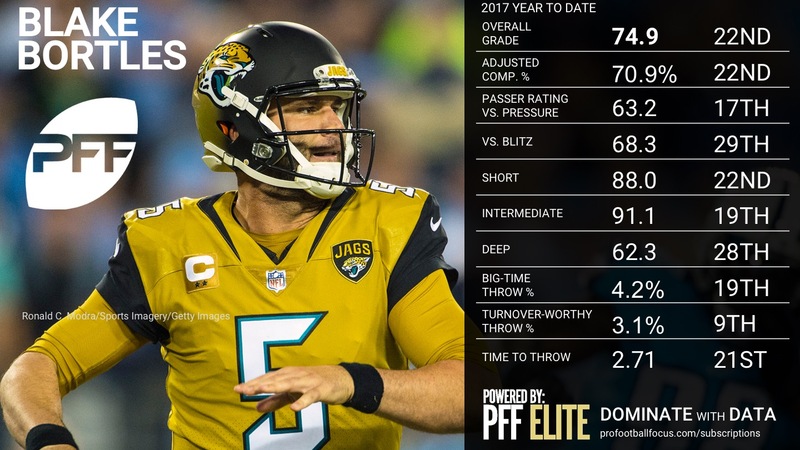 Roethlisberger has posted positive grades since his Week 5 disaster game vs the Jaguars, vaulting himself to number three in overall grades. 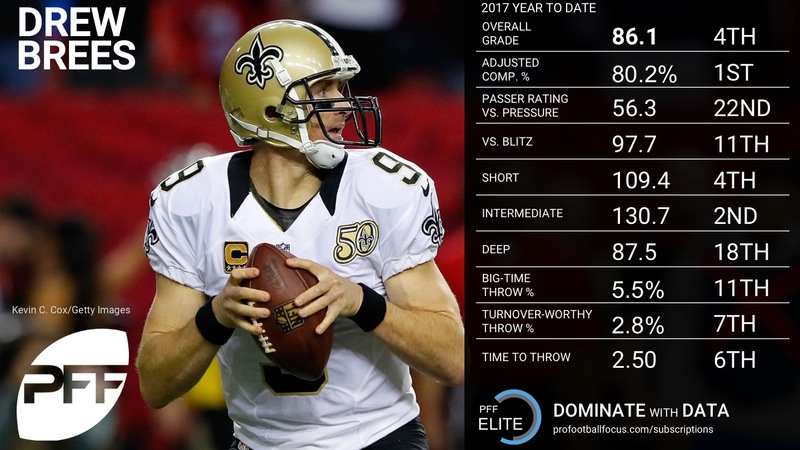 The stat sheet does not tell the story for Brees as he finished 22-for-32 for 246 yards with one touchdown and a passer rating of 101.8. He had three poor decisions that resulted in dropped interceptions and a large part of his passing stats came from running back Alvin Kamara picking up 106 yards after the catch (43 percent of Brees’ total for the day). Brees finished only 4-for-10 for 61 yards on passes thrown at least 10 yards in the air. 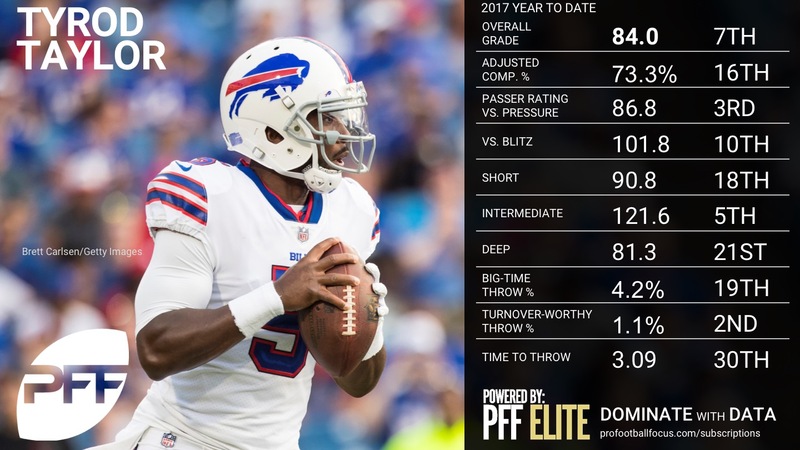 Smith struggled mightily again, as the Chiefs offense looked anemic against a Bills defense that has surrendered nearly 40 points per game over the past five weeks. 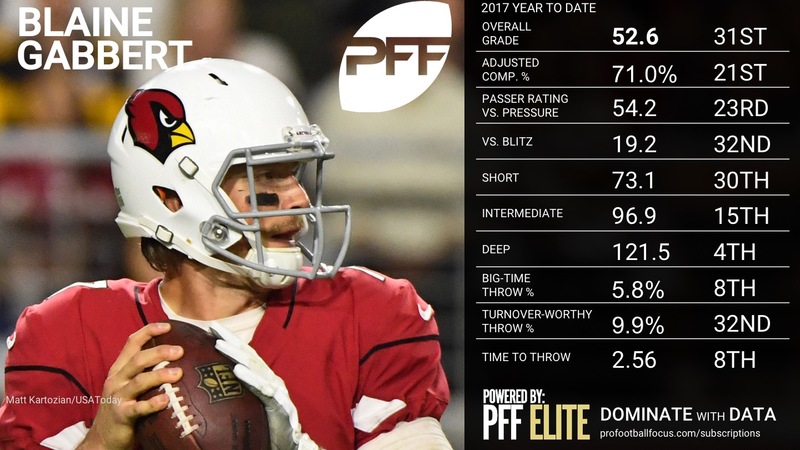 Smith was off with just about every facet, looking uncomfortable in the pocket, struggling to find the open man, and lacking any explosive plays down the field. 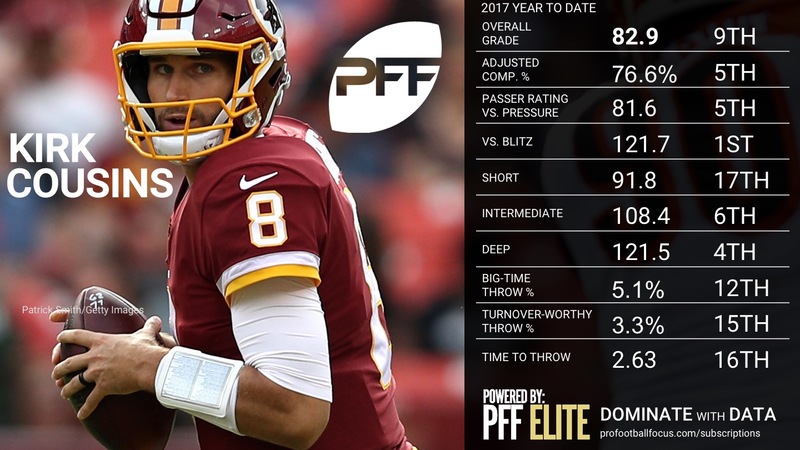 Only nine of his 36 attempts were thrown 10 or more yards downfield, as the confidence in his arm to make the throws he was at the beginning of the season simply has not been there recently. The Chiefs defense was able to keep them in the game as Smith had a chance on the final drive, only to be picked off by Tre’davious White to seal the game. 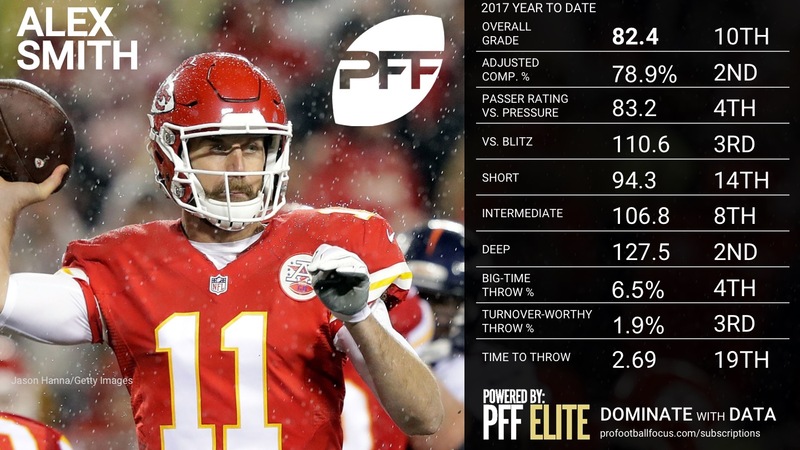 Despite the narrative the Chiefs are seeing more two-high safety coverages to take away their big plays down the field, Smith’s struggles throwing the ball vs man to man coverage and 3-deep zones have been a big reason for decline. 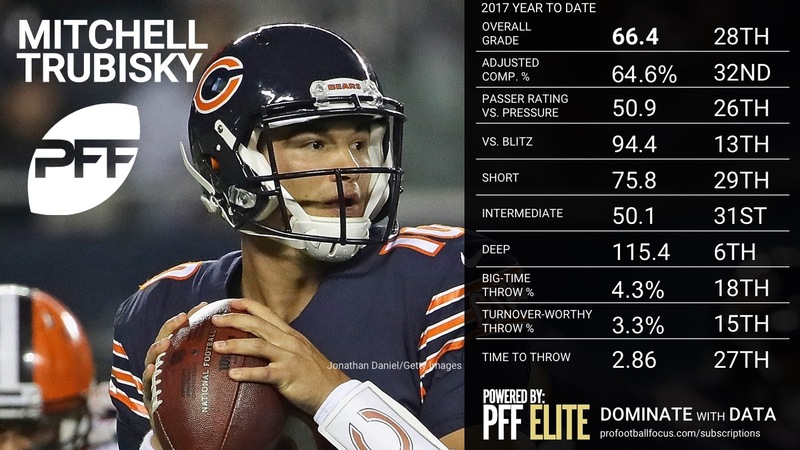 Week 1-5 (seen 51 percent of the time) – Completed 69 percent of throws with a 119.0 passer rating. 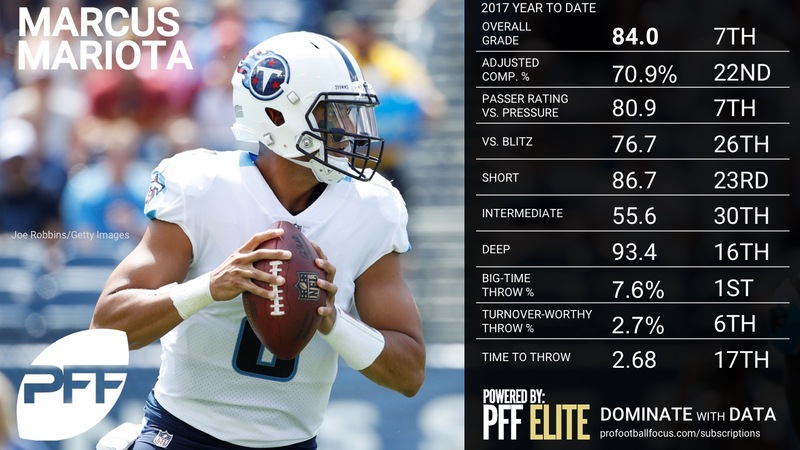 Weeks 6-12 (seen 55 percent of the time) – Completed 53 percent of throws with a 63.4 passer rating. 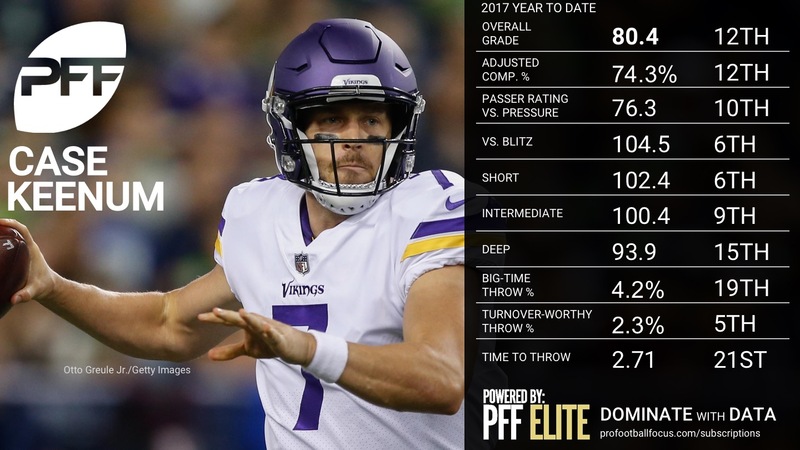 It was a solid Thanksgiving effort for Keenum who continues to exceed expectations in the Vikings’ offense. 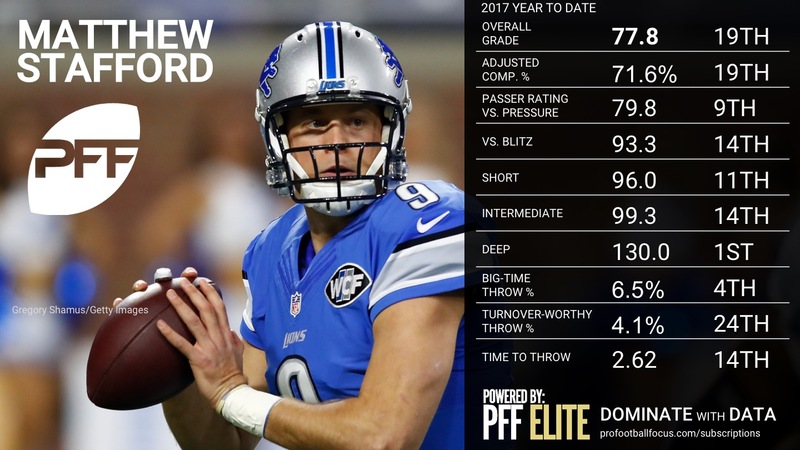 He’s been the best in the league at avoiding sacks (only five percent of his pressured dropbacks result in sacks) and that was on display again against the Lions as he was pressured on 18-of-35 dropbacks, but still finished with a passer rating of 106.6 in those situations. Keenum’s corner route for a touchdown while under heavy pressure was a thing of beauty, and a key play for the Vikings as they continue to roll and exceed expectations in the NFC. 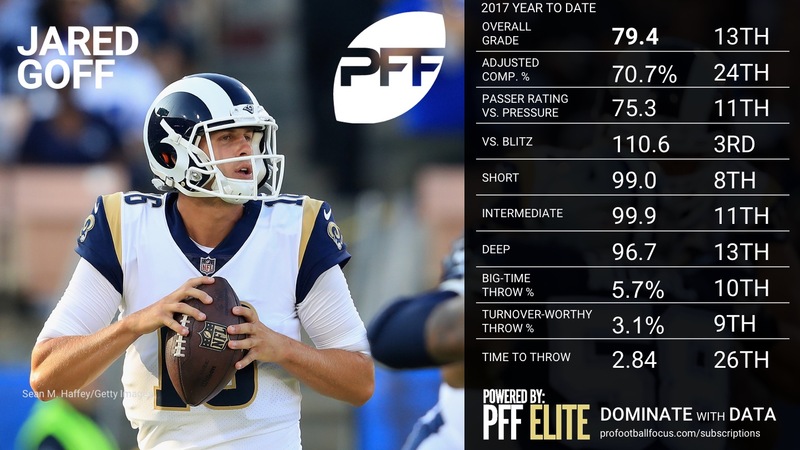 Goff played a clean game, avoiding turnover-worthy plays and spreading the ball around to eight different receivers. The Rams offense did a fine job of exploiting mismatches in the Saints’ secondary and Goff was able to capitalize. 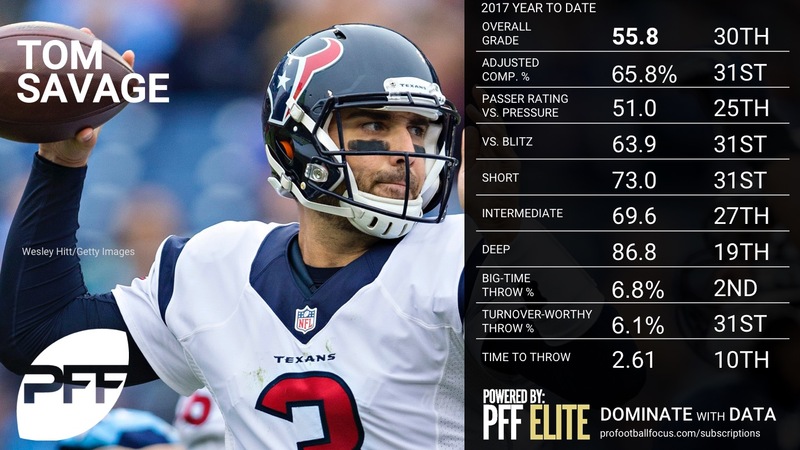 He went 7-for-12 for 110 yards and a touchdown on intermediate (10-19-yard) throws while adding three deep (20-plus yard) completions on seven attempts for another 122 yards. His lone interception was an underthrow on a deep ball, but a bad bounce led to the turnover. 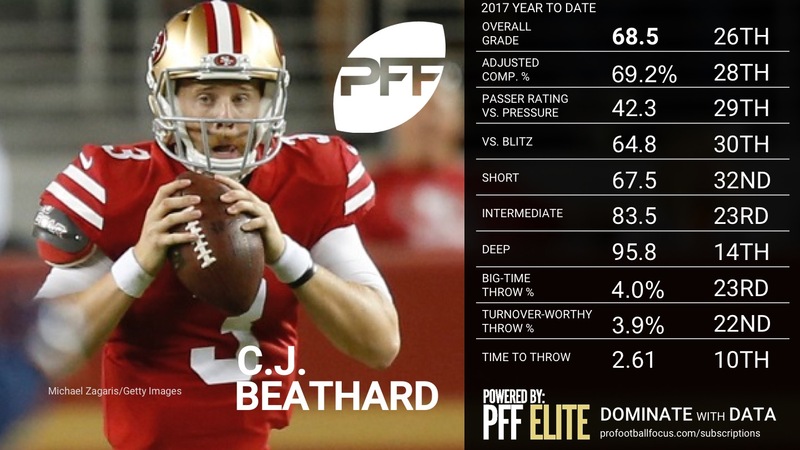 Goff was also outstanding against the blitz, going 11-for-17 for 118 yards and a touchdown. 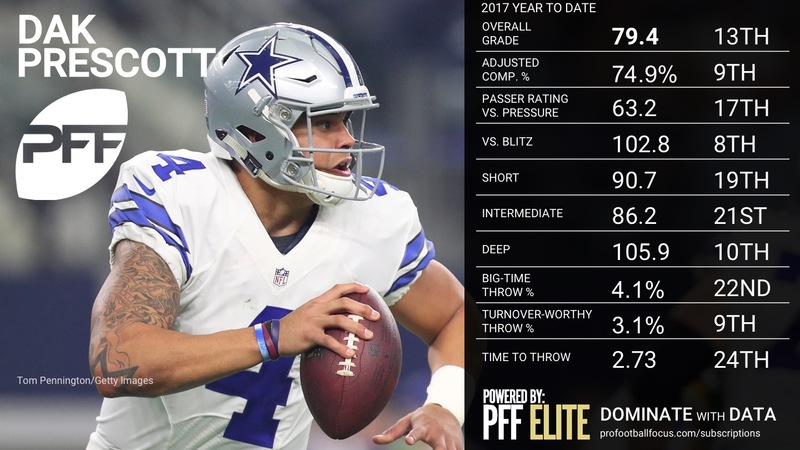 Rivers lit up the Cowboys secondary on Thanksgiving, posting the highest adjusted completion percentage of Week 12 at 84.8 percent. His chemistry with Keenan Allen was on full display a number of times, particularly on a corner route down the field that he threw away from coverage to the back shoulder, something you don’t see too often on that route. His downfield accuracy was there all game, going 4-of-6 for 143 yards a touchdown on throws traveling 20 plus yards. 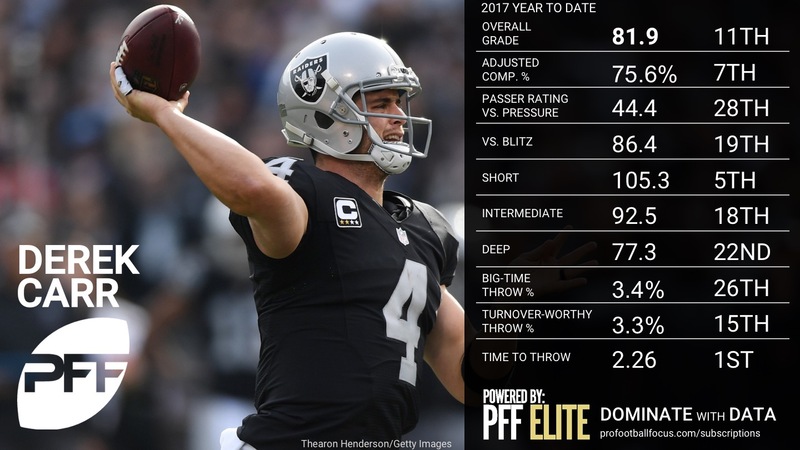 By far the most impressive aspect of Rivers game was his play under pressure, where he went 11-of-14 for 256 yards a touchdown and a passer rating of 142.6 under duress. 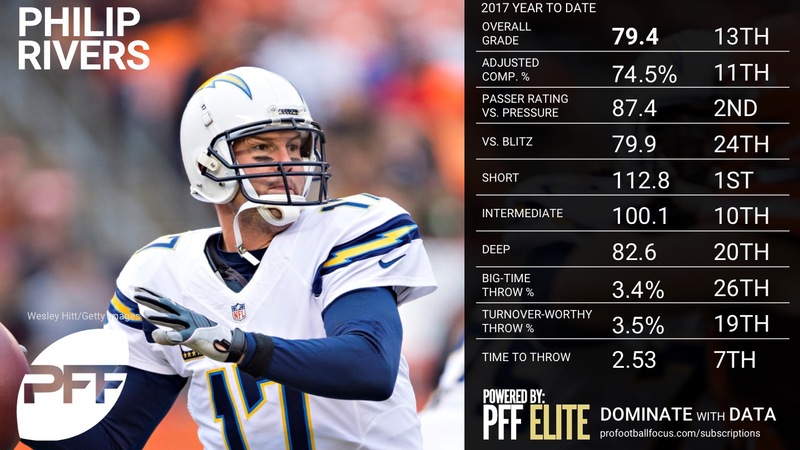 Rivers is getting hot at the right time, with a favorable schedule down the stretch giving them a good chance to pull it out in the AFC west. Newton struggled to find any type of rhythm throughout the game, misfiring on throws to all levels of the field. 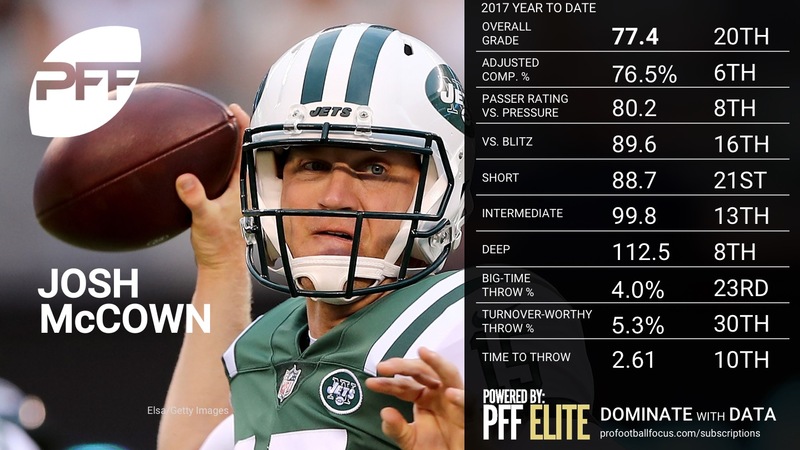 The Jets defense felt no threat of the Panthers vertical passing game, choosing to press their wide receivers with tight man-to-man for much of the game, with Newton and his playmakers failing to deliver any big plays down the field. 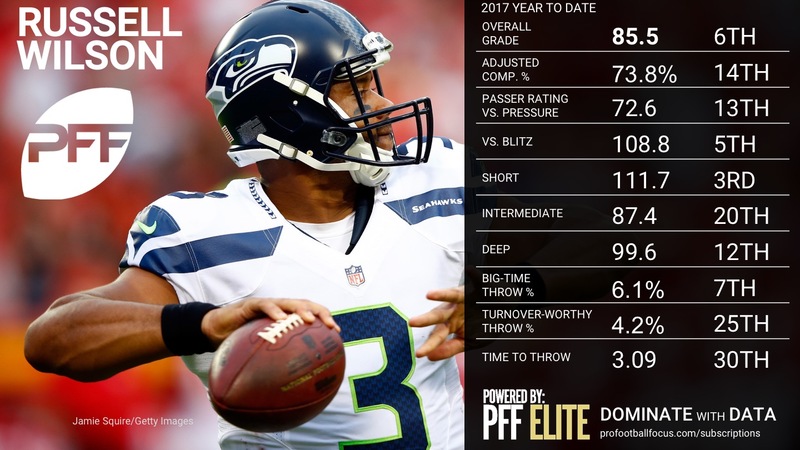 There were a number of under throws on deep shots, lack of touch on others, all equalling for Newton to go 1-of-7 for 25 yards on throws 20 plus yards downfield. 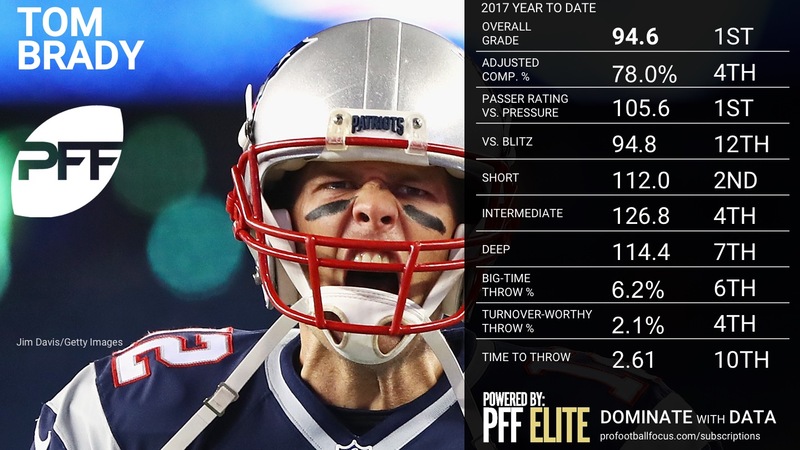 Newton’s misses underneath and at the intermediate level have been there all season, with him currently having the second-highest number of negatively graded throws. 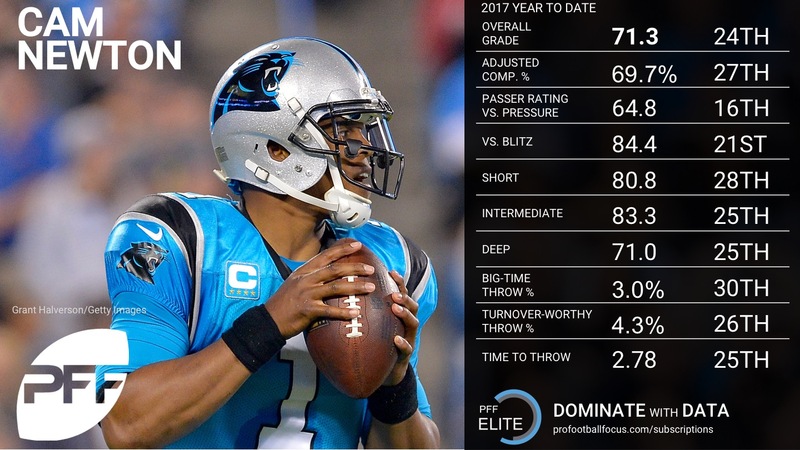 With the philosophical change in approach for Newton to be a more of a consistent and steady underneath passer, he has still struggled mightily and has not offset his underneath misses with enough big time throws down the field on a consistent basis. 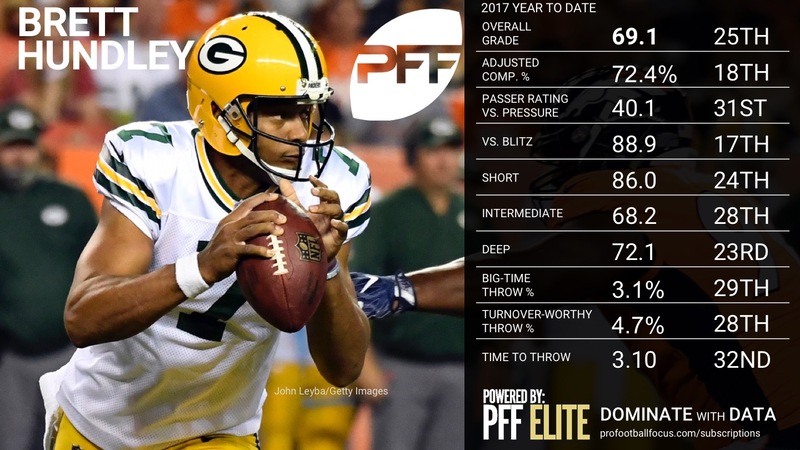 Hundley had his best statistical game as a pro, and it was a nice bounceback from a disastrous Week 11 game, but it was just a solid game overall. 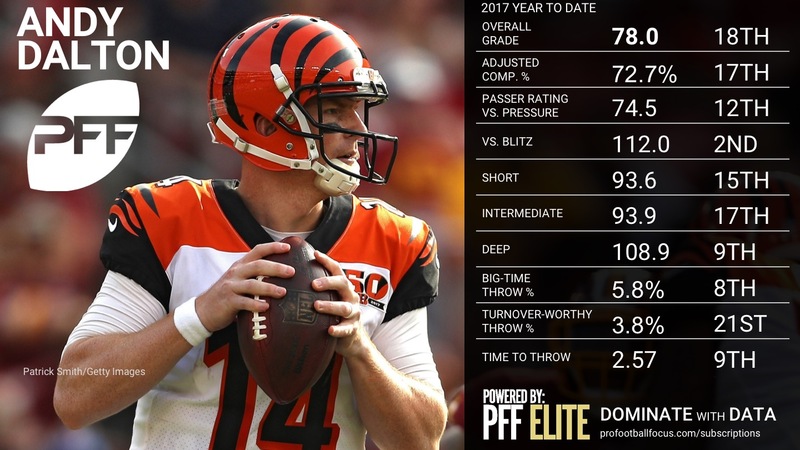 Hundley finished 17-of-26 for 245 yards and three touchdowns (passer rating of 134.3), but those numbers were aided by busted coverages on the back end by the Steelers as well as a 54-yard screen pass for a touchdown. He did hit Davante Adams on a nice double-move before he turned it into a 55-yard score and one of Hundley’s better throws of the night was a simple 4th-and-6 conversion in crunch time that he threw up and away from tight coverage. 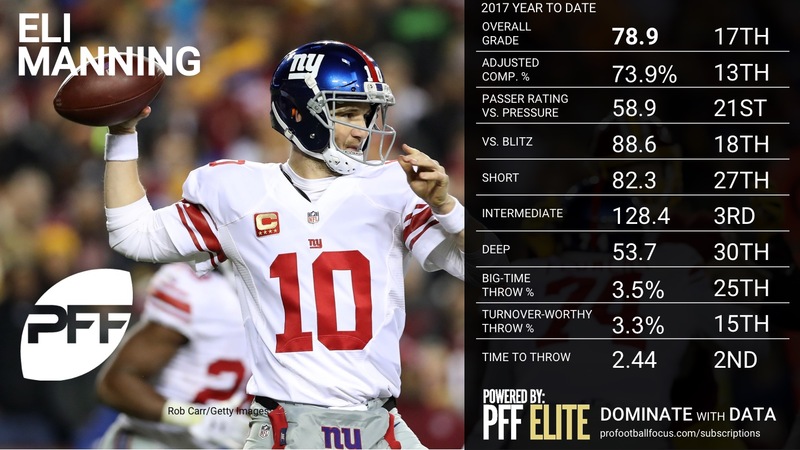 Beyond that, there are still issues with him taking too many sacks (sacked on four of 12 pressured dropbacks) and he completed only two out of seven passes when facing pressure. Hundley attempted only three passes at the intermediate (10-19-yard) range and did not complete one. 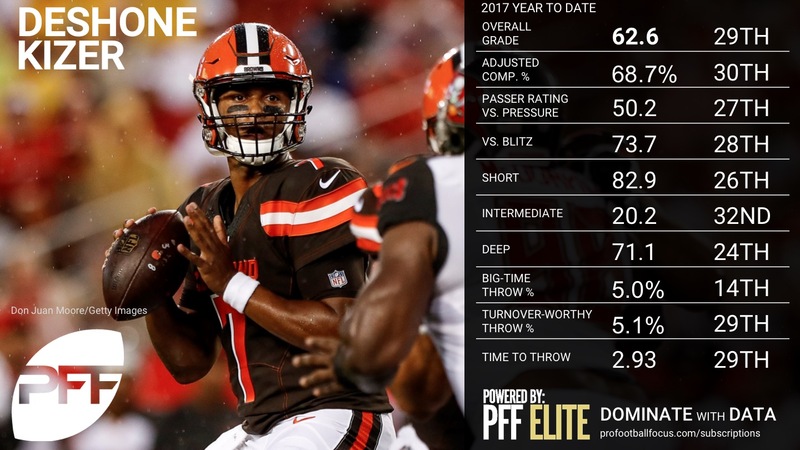 This was the best game we’ve seen from Kizer as a pro, as he was decisive, comfortable under pressure, and he threw the ball accurately to all levels of the field. 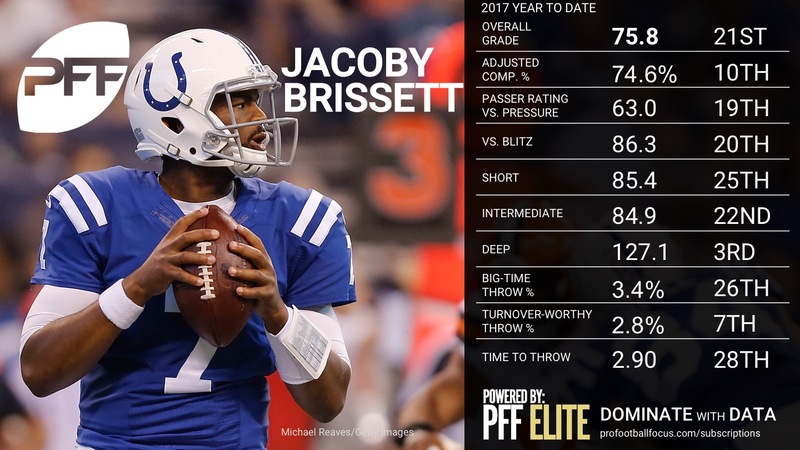 He had a number of #BigTimeThrows, including a downfield, bucket throw under pressure as well as a number lf well-placed seam routes, one of which was a dropped touchdown that would have made his passer rating jump from 86.5 to 103.8 for the game (if you’re wondering why Kizer’s best game showed an average stat line). Kizer went 4-for-8 for 131 yards on deep (20-plus yard) passes, incluidng that drop, and this was his best display of the high-end ability he flashed while at Notre Dame.